Unfortunately, Satan sneaks his weapon of madly assured destruction into the hotel, it escapes, and all Hell breaks loose. Will Heaven, Hell or Earth ever be the same again? In my time I’ve done many jobs that would fill up a rather long CV and prove that earning a living can be a dull but necessary evil. These varied roles tended to be office based and one day I realised that there was more to life than staring at a computer screen. So, I decided to write and ended up spending even more time staring at a computer screen. My Muse visited me when I wrote a joke article for a friend in North Carolina, informing him of the correct etiquette for an impending trip to Newcastle. He saw the funny side of it and liked what he read, sharing it with his friends. After that I wrote some more random articles but didn’t have an outlet for my wild scribblings until I badgered the owner of an arts website in Mississippi to read one of my comedy articles. He then let me loose on an unsuspecting American public. Unfortunately, the website closed, and I was left with creative urges, but no outlet so decided to try my hand at writing a novel and foisting that on the world. Allowing my strange and surreal sense of humour to run riot, I began creating my own versions of Hell and Heaven. 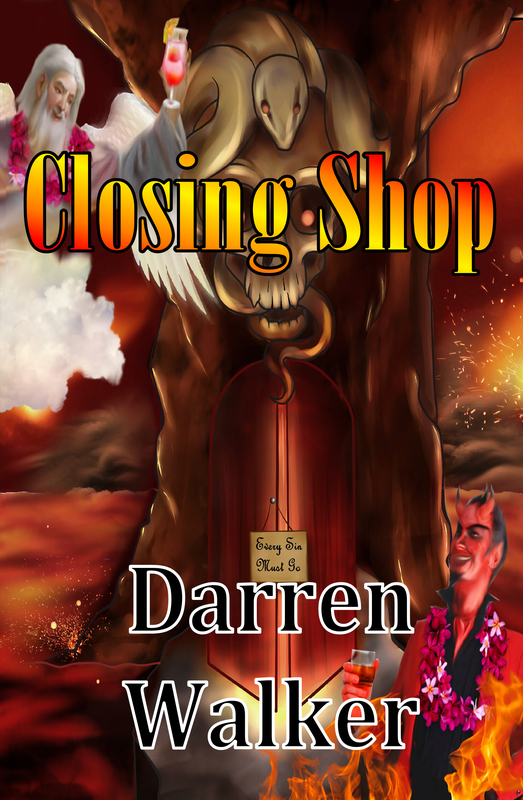 Closing Shop is my first novel however, I have written four more books in the series and don’t plan to stop there. When I’m not writing, which isn’t that often, I like to try and keep fit, but usually fail, I go to concerts and spend time with my family. Only published less than 2 weeks ago and waiting for reviews to come in. Very funny in a warped sort of a way.Just my type of humour.I thoroughly enjoyed it! Highly entertaining and will keep you turing the pages and chuckling or laughing out loud! Dark and daft in equal measures! Strangely enjoyable. Very interesting concept. I am not a huge prologue fan but Darren had me from the prologue. His sense of humor is scattered throughout the book which adds to the storyline. An exciting read on my holiday thoroughly enjoyed it. Great read and a well constructed narrative! can wait for the second instalment to be published! I loved this book and it had me in stitches. Great characters that were strong yet funny and the way he managed to create such a crazy story was pure genius. He is the next Terry Pratchett and I look forward to the sequel (s). Please let there be many more! Amazing read and very funny! Would highly recommend this book! Dark and funny but keeps you interested. Fantastic reading not a big bookworm but I couldn’t wait to pick it up again. Great characters and wit. Wonderful – a truly great way of teaching how sneaky satan can be. It is wonderfully written and I have already started to read its captivating sequel!